Cyprus is making an official complaint to motor sport's world governing body over what it calls a political "trick" at the Turkish Grand Prix. 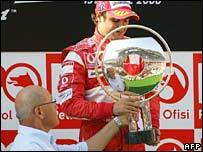 The Turkish Cypriot leader, Mehmet Ali Talat, presented the Formula One trophy at the televised event in Istanbul. However, he was introduced as president of the Turkish Cypriot "state" - which is only recognised by Turkey. Cyprus has been split since 1974, when Turkish troops invaded the north of the island after a Greek-inspired coup. "The Cypriot government will denounce this unacceptable and provocative piece of theatre," Cyprus government spokesman Christodoulos Pashardis told reporters after the Grand Prix award ceremony. He accused Turkish officials of exploiting a sporting event and "tricking" the organising body, the International Motoring Federation (FIA). "Mr Talat is neither a citizen nor an official of Turkey, the organising country, to be invited to present the Formula One winner's trophy," he stated. He also said the Cypriot Automobile Association would lodge a follow-up complaint. The event was watched by Greek Cypriots live on state television and by an estimated 2.5 billion people around the world. Ferrari's Felipe Massa claimed his first Formula One victory in an enthralling Turkish Grand Prix. 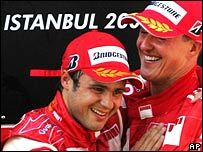 But team-mate Michael Schumacher slid 12 points behind Fernando Alonso in the title race, finishing third behind him after an absorbing tussle in Istanbul. Massa had been on pole and never looked troubled while Alonso sneaked past Schumacher on a pit-stop and held off the German over the tense final laps. Britain's Jenson Button drove a very consistent race to finish fourth. The turning point in Istanbul came on lap 14 when the safety car was deployed after Vitantonio Liuzzi had spun out of the exit of Turn One. The two Ferraris took the chance to refuel and Alonso, 10 seconds adrift in third, decided to follow suit. Race leader Massa pitted first, leaving Schumacher queuing behind him. Alonso took advantage and returned to the track just ahead of the German. 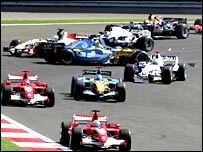 When Massa and Alonso pitted for the final time on lap 39, Schumacher assumed the lead and desperately tried to make up some precious seconds. However, after his final stop four laps later he could only re-enter the race back in third as Alonso again flew past in his Renault. Schumacher chased down Alonso, who was struggling with blistering tyres, over the last 15 laps but, despite some nail-biting passing attempts, he could not overhaul the Spaniard. Massa took the chequered flag for the first time in his 67-race career, finishing five seconds ahead of Alonso with Schumacher less than a second further back. "It is a fantastic day for me," said the 25-year-old Massa, who was attracted to Formula One after delivering pizza to the Interlagos circuit in Brazil. "When I think about everything I did in my life to get here, I'm very happy and emotional. "The car was well balanced during the whole race, so I could keep the gap and not drive too aggressively." Schumacher will rue another lost chance with only four races left to cut the gap on Alonso in the drivers' standings. To complicate matters further, the 37-year-old is expected to make a statement on his future at the next race in Monza on 10 September. But in the immediate aftermath in Istanbul he only had praise for this team-mate, saying: "Felipe did a superb job. "It was a nice fight towards the end. And one of the things that's good about this team it that when one of us can't do it, the other will." Alonso had mixed feelings after a demanding race in Hungary but was largely satisfied to keep Schumacher at bay for now. "I'm happy to hold off Michael but not happy because we couldn't win," he said. "I managed to finish in front of Michael by half a car and there are areas we need to improve before the next race." Button followed up his maiden win in Hungary with a solid fourth place in Turkey ahead of McLaren's Pedro de la Rosa. The Honda driver moved up from sixth on the grid to fourth and never faced - or mounted - a serious challenge. "It was a pretty boring race for me because it was all quite quiet," Button said. "As a team we did a perfect job this weekend, but we just don't have the pace. It would have been nice to challenge Renault." Giancarlo Fisichella added some useful points for Renault in the constructors' race as he battled his way up to sixth after a chaotic spin on the opening lap. Fisichella spun a full 360 degrees out of Turn One to simultaneously open up the field and cause a six-car shunt. McLaren's Kimi Raikkonen came off worst after he was hit by Scott Speed and retreated to the McLaren pit for repairs. But the Finn, who won the inaugural Turkish Grand Prix in 2005, was suffering with suspension trouble and ploughed into the tyre wall on his return to the track. Scot David Coulthard also endured a see-saw race and retired after 55 laps in his Red Bull. Team owner Frank Williams has accused engine partner BMW of poisoning their relationship by incessant sniping. "Our partnerships in the past with Renault and Honda have been more successful and co-operative," Williams told Autosport magazine. "You never had this constant finger-pointing. We do not constantly ask why BMW had some 150 engine failures in 2000 alone." BMW has criticised the performance of Williams' cars in recent years. The German manufacturer has a contract with Williams until 2009, but is expected to expand its Formula One programme next season by supplying Swiss team Sauber as well. Williams won the constructors' championship with Honda in 1996 and '97, when they also won the drivers' title with Nelson Piquet. And the team won four drivers' titles and five constructors' titles between 1992 and '97 while partnering Renault. But their best results with BMW have been second places in 2002 and 2004, in a period dominated by Ferrari. And despite Ferrari's problems in 2005, Williams have again got off to a slow start this season, with Renault and McLaren dominating the year so far. World champion Michael Schumacher has given up making predictions about his prospects in future races following his worst start to a Formula One season. The German goes into this weekend's Canadian Grand Prix with 16 points, 43 behind leader Fernando Alonso. 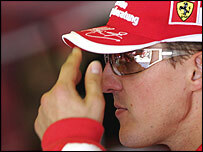 "My predictions haven't been all that great lately," said Schumacher. "There are so many teams delivering good performances, so I'd rather wait before I say anything. But we'll clench our teeth and put up a big fight." Schumacher has the best record of any driver in Canada, winning that race for the last three years and seven times in total. No other driver in the history of Formula One has won the same race as much, although Schumacher has also won the French Grand Prix seven times. "I'm going to go to Montreal and make the best of whatever comes up there for us," added the German. "We'll have to wait and see what happens during Friday's practice sessions to be able to say more." Ferrari have yet to win a race this year, with Renault triumphant in five and McLaren in two.